Marvel’s Agents of S.H.I.E.L.D. TV show started back up this week and it was great to catch up with the gang. The thing is, they never went away. Imagine a world where there was no summer hiatus and no months of anxiously waiting for your favorite S.H.I.E.L.D. Agents to come back. Agents of SHIELD #9 is a testament that these characters never truly went away. At this particular moment in time, the team is embroiled in Marvel’s Civil War II, which sees longtime teammates on opposite sides of a moral dilemma. You don’t need to concern yourself with the details if you haven’t been following along because this issue is just plain fun. Newbies are welcome. Enough with the background. Marc Guggenheim wastes no time picking up where the previous issue left off. Fitz finds himself on the wrong end of Elektra’s sai and things look pretty bad. You’d think that she’s the villain, but you’d be wrong. 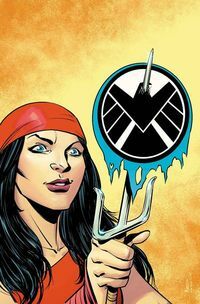 Elektra is (once again) a member of S.H.I.E.L.D., and she’s taken over for Phil Coulson. Ward is back, Daisy is on the outs with the team, Coulson is being hunted by S.H.I.E.L.D. Director Maria Hill, Simmons is in a struggle for her life — things are upside down, and I love it. If you’re a fan of the television show and you’re not reading this series…you’re missing out, bub. The Agents of SHIELD comic book series is unencumbered by a television budget or film rights to certain Marvel characters — we get a ton of action in each issue, which makes this series well worth the price of admission. Leaving off, it must be said that whoever put series artist Ario Anindito and color artist Rachelle Rosenberg together should be promoted. They’re a great team who’ve given us one hell of a comic. Order your copy of Agents of SHIELD #9 today! Editor’s Note: Grant Ward is the worst. Even though I despise him for the whole Hydra thing, I find myself hooked by his role in this issue (no spoilers here, folks) and am interested in seeing how things play out in future issues. Great job Guggenheim! Marvel Relaunches Comic Book Series With Marvel NOW!